The Independent Film house is Back!!! That’s right, the IFC house will be poppin for the duration of the festival. That means at the corner of 7th and Brazos street you’ll find the IFC house hosting performances from Liz Phair and The Kills during the much appreciated “All Day Happy Hour”. Guests will also see IFC doing exclusive interviews with the SxSW keynote speaker, Bob Geldof. Further interviews, taking place through out the festival from march 11-20, will come from Rainn Wilson, Ellen Page, and Gregg Mottola and Simon Pegg from “Shawn of the Dead” and “Hot Fuzz”. Thrill seekers over 18 can RSVP right here, and gain exclusive access to all the performances, interviews, and Films showcased in the IFC house. 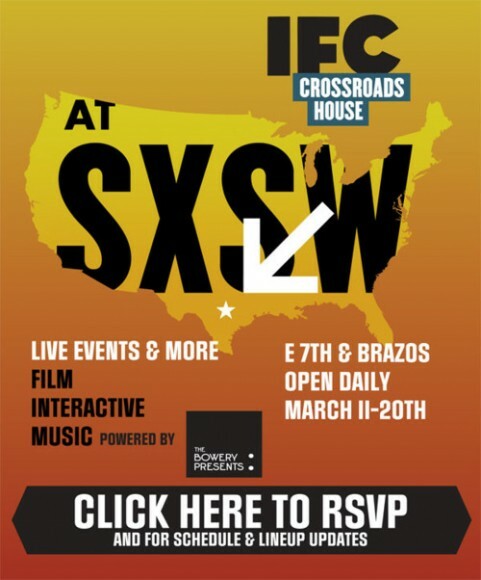 The IFC Crossroads House will be in Austin for the duration of SxSW. The doors will be open from 3 – 10 p.m. during the film and interactive segment, 3/11-3/15, and from 12 – 8 p.m. during the music portion of the festival, 3/16/-3/19.